Since May 2006 I am a postdoc in the Theory group at the Max Planck Institute for Polymer Research. I am working on hexabenzocoronenes, trying to investigate the two main factors influencing the conductive properties of these systems: the relative position of the molecules in the liquid crystal mesophase and the nature of the conjugated core. The first aspect has been and will be investigated by atomistic and coarse-grained simulations. The chemical composition and the possibility of doping of the conjugated core will be investigated by a rational compound design approach in collaboration with Dr. O.A. von Lilienfeld. In 2006 I finished my PhD on simulations of conjugated oligomers at Politecnico di Milano (group of Prof. G. Allegra and Prof. G. Raos). During my PhD I received a scholarship from the International Max Planck Research School and I spent six months between 2004 and 2005 at the Max Planck Institute for Polymer Research working on conjugated oligomers (oligofluorenes) with Prof. G. Wegner and Dr. N. van der Vegt. 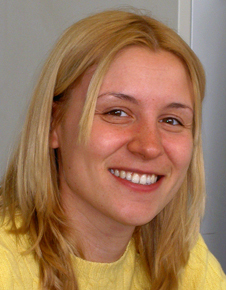 Since May 2009 Valentina is working in the Center for Smart Interfaces, TU Darmstadt. Discotic mesophases are known for their ability to self-assemble into columnar structures which serve as semiconducting molecular wires. Charge-carrier mobility along these wires strongly depends on molecular packing which is controlled by intermolecular interactions. Using solid-state NMR and molecular dynamics simulations we relate how conformations of alkyl and glycol side chains affect helical pitch and angular distribution of molecules within the columnar structures of perylenediimide derivatives. Using the high-temperature limit of Marcus theory we then establish a link between the secondary structure and charge-carrier mobility. Simulation results are compared to pulse-radiolysis time-resolved microwave conductivity measurements. We conclude that for achieving high charge-carrier mobilities in discotics side chains with specific interactions are required in order to minimize the translational and orientational molecular disorder in the columns. Using atomistic molecular dynamics (MD) simulations we study the columnar phases of perylene tetracarboxdiimides (PDI) and establish correlations between the molecular structure packing and dynamical properties of these materials. Combining electronic structure calculations MD and kinetic Monte Carlo simulations a correlation is then established between molecular structure and charge mobility of columnar mesophases of perylene tetracarboxdiimide derivatives. Charge mobilities of several derivatives of discotic liquid crystals have been determined by combining three methods into one scheme: (i) quantum chemical methods for the calculation of molecular electronic structures and reorganization energies (ii) molecular dynamics for simulation of the relative positions and orientations of molecules in a columnar mesophase and (iii) kinetic Monte Carlo simulations and Master Equation approach to simulate charge transport. Applying this scheme to differently substituted hexabenzocoronene derivatives we reproduce the trends and magnitudes of mobilities as measured by pulse-radiolysis time-resolved microwave conductivity (PR-TRMC) and connect mobility directly to the microscopic morphology of the columns. Our study also shows that it is possible to understand and reproduce experimental charge transport parameters and in some cases accurately predict them. A correlation is established between the molecular structure and charge mobility of discotic mesophases of hexabenzocoronene derivatives by combining electronic structure calculations molecular dynamics and kinetic Monte Carlo simulations. It is demonstrated that this multiscale approach can provide an accurate ab initio description of charge transport in organic materials. Using atomistic molecular dynamics simulations we study solid and liquid crystalline columnar discotic phases formed by alkyl-substituted hexabenzocoronene mesogens. Correlations between the molecular structure packing and dynamical properties of these materials are established.